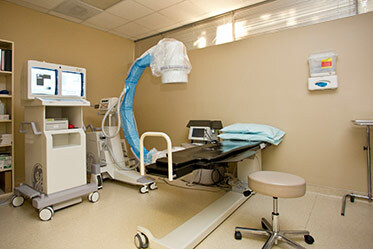 For any unexplained joint pain, your physician may recommend a diagnostic procedure called a fluoroscopy. This is a procedure involving multiple x-rays of a joint using a fluoroscope, which immediately shows an x-ray image. An iodine solution is injected into the joint area to highlight areas around the painful joint and bring into focus the internal workings of specific joints and soft tissue structures. Problems with the ligaments, cartilage, tendons, or the joint capsule of the hip, shoulder, knee, ankle or wrist can be identified in many cases, but the most commonly studied joints are the knee and shoulder.